Rabbits can make great pets. They are fluffy and conjure up more cuteness than any one animal has a right to. 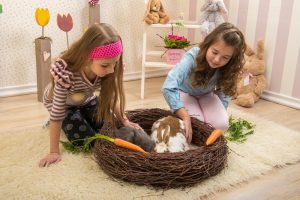 If you are considering buying a rabbit as a pet, you will need to plan ahead to determine where you will house your rabbit. You should have your rabbit housing set up first before you bring the rabbit home. This is doubly important if you have other pets in the home. Rabbits can actually get along with cats and dogs after an introduction period. However, you do not want to mix a new rabbit with your cat or dog without a safe barrier between them. It may take some time for your existing pet to become comfortable with your new rabbit. You may be wondering where rabbits live in the wild. Rabbits are found on every continent on the planet, except for Antarctica. Even though they don’t call that particular snowy wilderness their home, they can actually survive just fine in cold conditions and snow. You can even find rabbits in deserts. Rabbits live in all sorts of terrain. 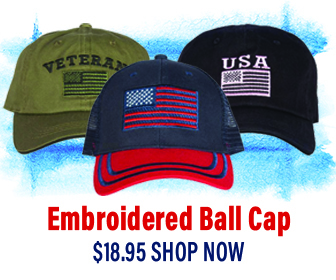 This includes grasslands, forests, mountains, hills, and meadows. Rabbits are most populous in North America, and in fact, about 50% of the world’s rabbit population lives in North America. Rabbits can be pests, however, and in Australia, where they are not native, they have become an invasive species. Rabbits can easily overpopulate an area where they don’t have natural predators (such as Australia). When destructive, they can destroy crops. A rabbit’s natural habitat is an underground burrow or warren, which is often a maze of tunnels that usually has many different entrances. 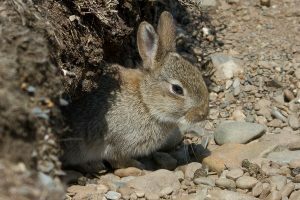 The exception is the cottontail rabbit, which, like the hare, lives in above-ground nests. When rabbits become pets, they usually live in large cages called rabbit hutches. These can be indoor or outdoor. While some rabbit owners let their rabbits run free in penned off areas outside, this can make them vulnerable to predators. For this reason, many pet rabbit experts recommend keeping rabbits indoors, or, in the least, providing a safe, enclosed hutch for outdoors. Rabbits can roam freely in an indoor home, but they are still often kept in rabbit hutches and let out under supervision. In a rabbit hutch, a nest box is usually set up. This is where the rabbit sleeps. While nesting boxes may be made out of wood, you might choose to get a metal box. This will stop the rabbit from chewing the box to pieces. For an average-sized pet rabbit, a good box size is approximately 16” long, 10” wide, and 8” high. Your rabbit will not want to sleep in a cold metal or wooden box without any padding. You will need to place some fluffy, warm nesting material in the box. That way, the rabbit can snuggle in and burrow into the material. Straw is one example of nesting material, although it’s not necessarily fluffy. Try not to get overly dry, brittle straw, as your rabbit will enjoy soft straw better. Shredded newspaper is another option. You can also fill the first two inches of the box with shaved cedar to make it smell nicer and then add some hay on top of the cedar. Just make a little hole with your hand. This gives the rabbit a starting place for burrowing. Momma rabbits will actually chew off some neck fur and line the hole with it. If you groom your rabbit, you can save the fur you combed off and put it in the rabbit hutch. The rabbit will then use this material to line the nest. Periodically, the nest may need to be cleaned and changed. You don’t want a stinky, moldy nest and neither does your rabbit! Check the rabbit nest frequently to make sure it is clean and in good shape. If you are raising baby bunnies, you need to change the hay in the nest box daily. Baby bunnies are at risk for enterotoxemia if old hay is left in the nest. This can cause terrible diarrhea, which is not fun for the bunny and terrible to clean up. Imagine if you were gifted a new home and told not to worry about the furniture. Yet, when you arrived, you had no bed! Where would you sleep? The cold, hard floor? Likewise, your new pet bunny needs a bed to sleep in. 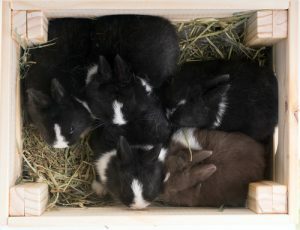 Welcome your new rabbit friend in your home with a nice, cozy rabbit nest box. Your rabbit will silently thank you.